Video editing is a very useful skill nowadays. While not everyone can make a professional career out of it, learning it as a hobby will allow users to show off personal photos and videos with much more flair and pomp. However, it’s better to start off with video editing software that doesn’t have too many features that will only serve to confuse beginners. The Easy Video Maker is a multimedia editing software developed by RZSoft that has a lot of features can make your videos more interesting and fun, but not so complicated as to render you completely lost in the process. 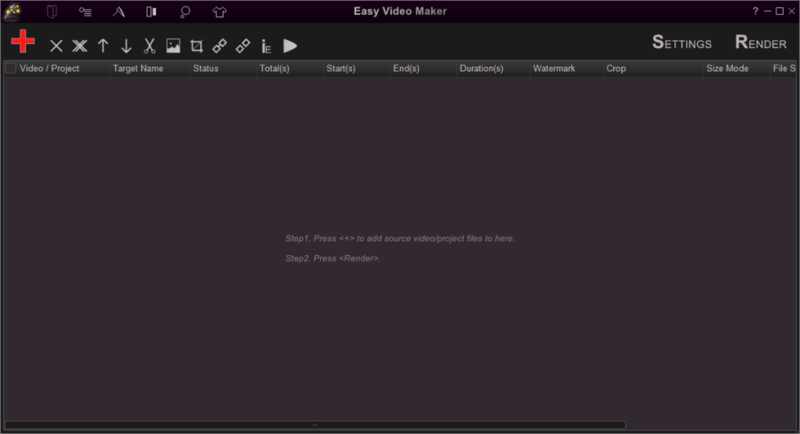 Installing the Easy Video Maker is uncomplicated, although it did take a few minutes. Although it required no additional programs to be installed, there was a lot of extracting and loading that took a bit of time to finish. However, once the installation is complete, there are no problems when it comes to executing the program. If there is one noticeable flaw with this software, it would probably be the interface. It’s a bit cluttered and unbalanced. For some reason, the windows aren’t all the same size. Some are taller than the others. The toolbar buttons are also spaced sporadically across the screen and it makes it difficult to distinguish which panel they should be for. The Settings, Preview, and Render buttons are also really large in comparison to the rest of the buttons for no discernable reason. These are all minor flaws, of course, and not at all deal breakers. The cluttered interface does mean that the Easy Video Maker has a lot of features for video editors, though. 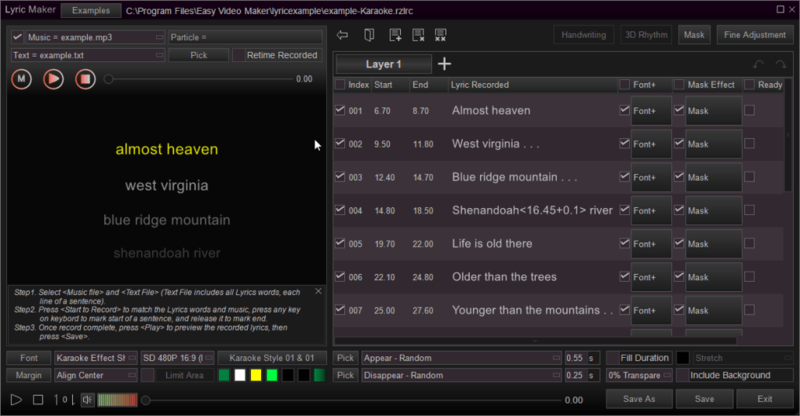 For example, you can easily add lyrics to a music video using this software. You can also directly record your screen using the Easy Video Maker. This software also supports batch processing, so you’ll be able to edit lots of videos at the same time. 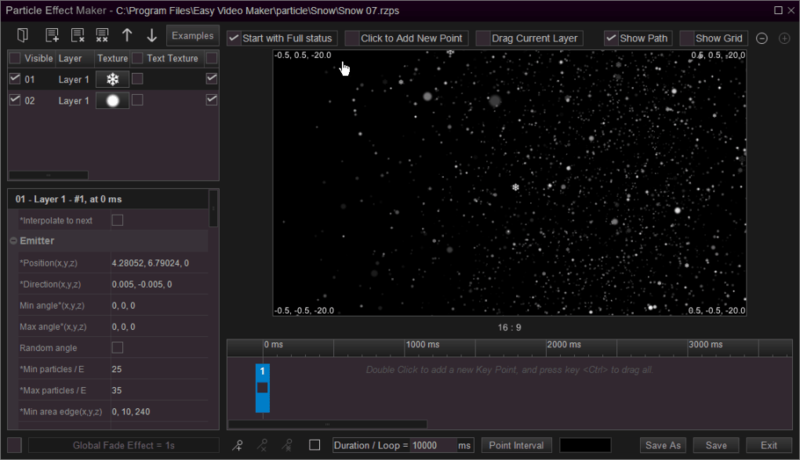 In terms of special effects, Easy Video Maker has some simple ones, but it does have a wide variety. You can do basic visual adjustments like changing the color saturation and image contrast. You can also add more decorative elements like snow, colorful dots, and more. 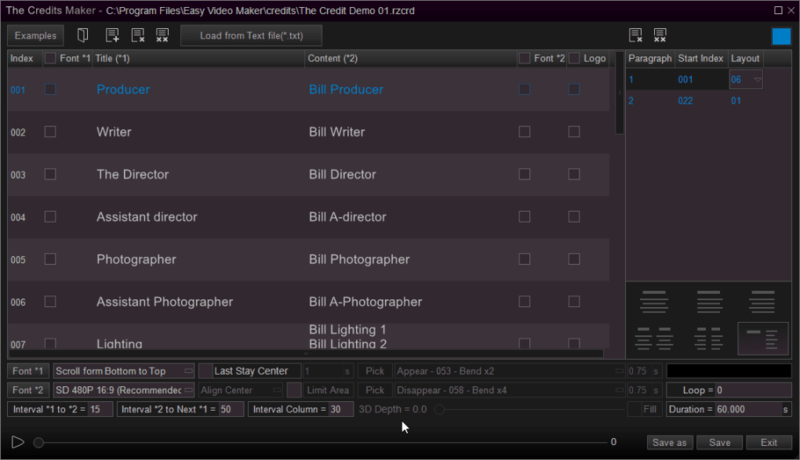 One great thing about the Easy Video Maker is that all of its timeline layers have labels on them and the different multimedia that you can add should be placed on the correct layer. For professionals, this might seem too restrictive, but it is helpful for beginners. 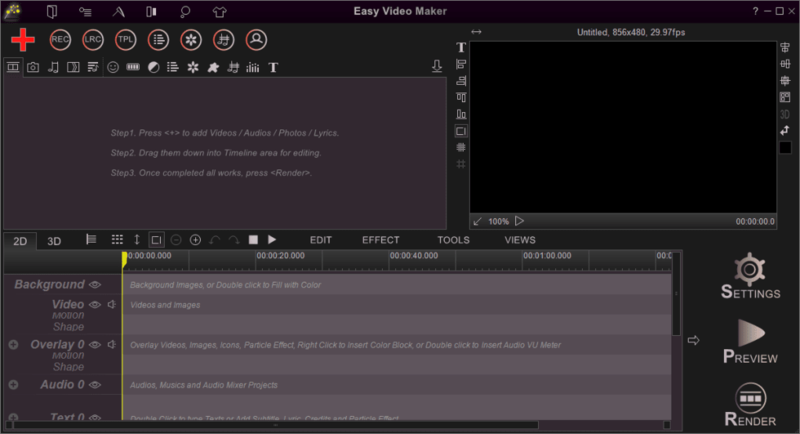 The Easy Video Maker seems daunting at first glance because if the very cluttered interface. However, once users get the hang of how it works, there’s no denying its simplicity. It may have a steep learning curve, but it’s well worth the time to learn. The developers also did not slack off when it came to features since the Easy Video Maker has a lot of additional functions that many video editors will certainly appreciate. If you need a feature-rich video maker, this one is a good option. Easy Video Maker provides the total solution of editing, creating, making videos/movies, with it we can easy to Edit, Create, Make high quality 2D/3D videos/movies from various formats of video clips, images, audios, lyrics, texts, etc. Built-in powerful video editor, audio editor, lyrics/karaoke videos maker, video and audio recorder, video converter, etc. Create/Make high quality 2D or 3D video/movie from various formats of video clips, pictures, audios, musics, lyrics, texts, subtitles, etc. Quickly mass Make Videos in batches, videos/movies can be mass produced. Powerful Video Editor, easy to cut, trim, split, join, mix, merge, crop, resize, rotate, zoom in/out, fade in/out, video chroma key, change video color, change video shape, speed up/down, etc. Powerful Lyrics/Karaoke Video Maker, easy to make wonderful 2D/3D lyrics/Karaoke video. Easy to Record/Capture high quality videos from screen, cameras, capture cards, etc. Easy to Record/Capture high quality audios from any audio device, audio input pin, etc. 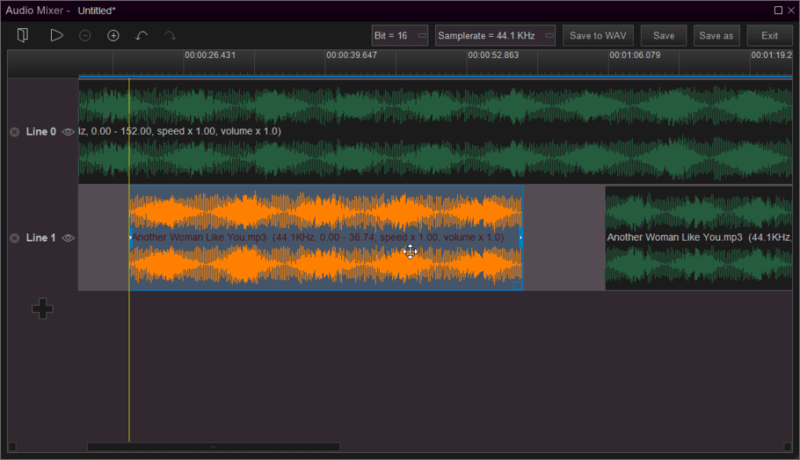 Easy to Mix multiple audios. 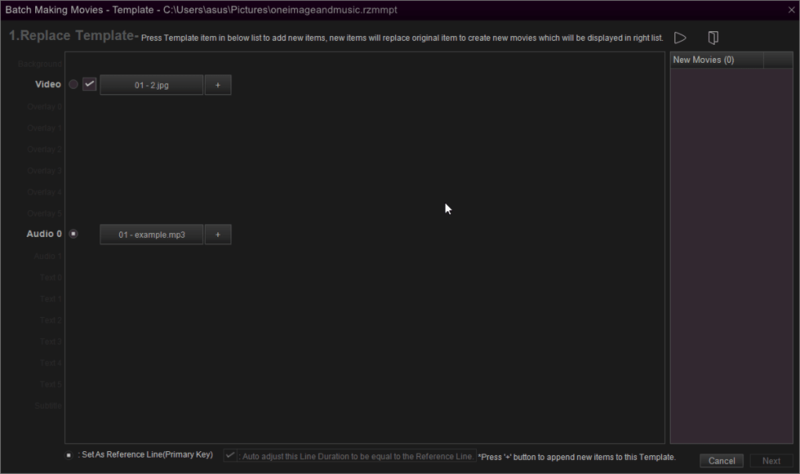 Easy to add cool transition effect, motion effect, mask effect(light and shadow effects), special effect, etc. Easy to speed up/down the video and audio playback speed. 1. provides a free edition, no watermark, no use time limit, only limits some features. 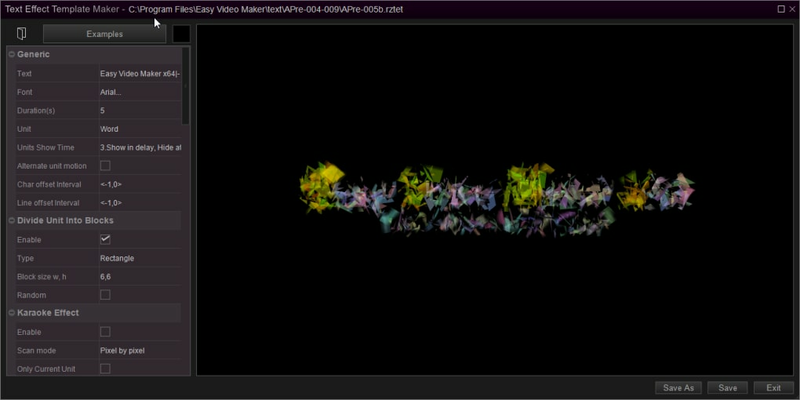 2. can be used to make best 2D/3D lyrics video or karaoke video. 3. powerful video editor, edit any formats videos, cut, trim, split, join, mix, merge, crop, resize, rotate, zoom in/out, fade in/out, video chroma key, change video color, change video shape, speed up/down, etc. 4. can be used to make 3D video, supports single or multiple cameras. 5. videos can be mass produced. Great movie maker I've ever used till now.. Great movie maker. I use your product to make movies and use them to teach in class. I'm a teacher in Thailand. I "need" your product because it is very easy to make movie and it has got a lot of great tactics to make movies. But I don't have any credit cards. So i can't buy your product. If any agents in Nakon Si Thammarat province, Thailand, please inform me . thank you very much. Should NOT be listed as free software.. Really Bad and NOT really free! 5 minute limit on videos in &quot;free&quot; version. What do you think about Easy Video Maker? Do you recommend it? Why?